Hampstead is located between the beach communities of Surf City and Topsail Island. 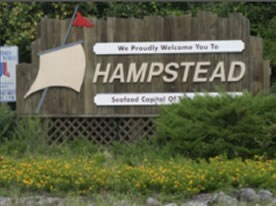 Once a small fishing village and whistle stop on the Atlantic Coast Line Railroad, Hampstead is one of the fastest growing areas in the state as more and more people flock to the coast for easy living on our waterways, creeks, and golf courses. In the late 1780s, during one of Washington’s many trips on the Kings Highway, he planned to spend the night in the area and feast on local mullet caught in the Topsail sound. However, when he arrived, the mullet were not running and Washington had to feast on Ham instead. Since then, the area has been known as Hampstead. Known as “The Seafood Capital of the Carolinas,” Hampstead is home to many local seafood vendors and a growing number of restaurants. Hampstead also offers a diverse array of shopping. From eclectic boutiques to mainstream storefronts, you are sure to find a unique memento. Mark your calendar for Mother’s Day weekend and join us for the “Celebrate Hampstead” Festival, a local tradition of businesses and arts colliding for the benefit of the Greater Hampstead Chamber of Commerce and the Topsail Schools’ arts programs.